Copenhagenize News Blog — Copenhagenize Design Co.
Last week, members of our Copenhagen team visited San Sebastian to deliver a series of workshops promoting the use of cargo bikes. The event was part of the ongoing EU Horizon 2020 Project, City Changer Cargo Bike. Accompanied by 15 European municipalities, the week’s programme had participants explore how they can unlock the potential of cargo bikes in their cities. 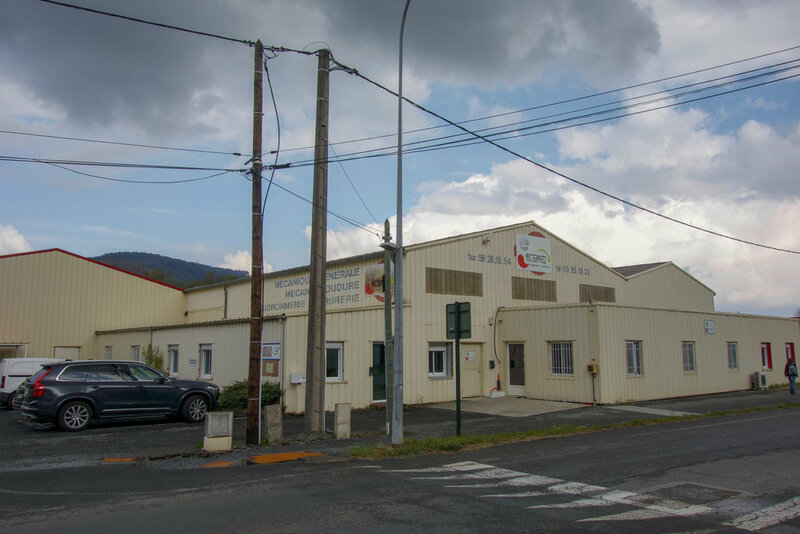 Beyond the workshops, the programme included cargo bike test rides, a visit to a local micro-distribution hub, and the factory of French cargo bike company, VUF. Kicking off the week, our friends at Txita (pronounced “Cheetah”) hosted a series of cargo bike test rides for the general public and workshop participants alike. We tested bike models from Denmark, the Netherlands, and France at the city’s former bus station turned bicycle parking and micro-distribution hub. On a site visit to Mauléon-Licharre, France, we met Thomas and Anthony Chenut, founders of VUF Bikes. In just two years, the brothers have brought their cargo tricycles and modular trailers to market. With a unique rear axel turning mechanism, VUF bikes have already found success supplying to airports, train operators, and a mix of other business customers. Tellingly, VUF Bike frames are made alongside aerospace components, showcasing the role of cargo bikes as a 21st century solution. At Txita’s micro-distribution hub, where trucks are unloaded for last-mile delivery by bike, we met Dani and his team of deliverers. 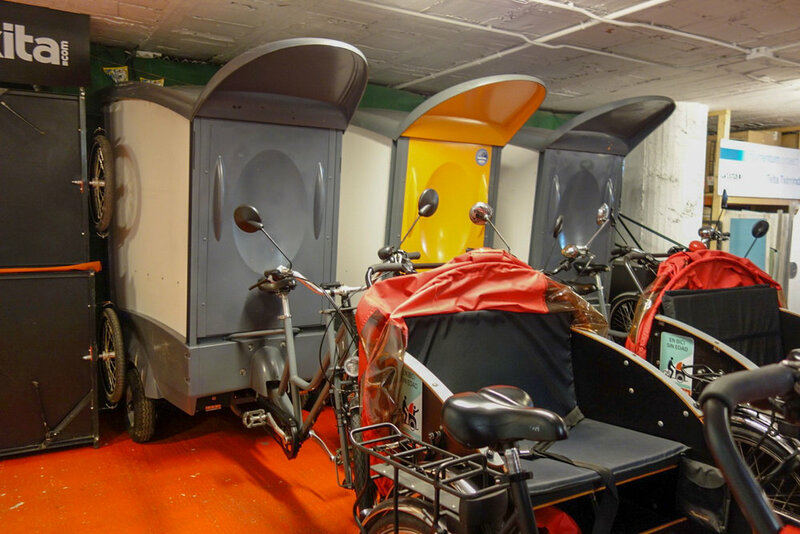 Out of their 130-square metre space in the parking garage of a modernist tower, Txita distributes packages through San Sebastian’s central neighbourhoods on their fleet of electrically-assisted cargo bikes. It’s here you’ll also find their fleet of taxi bikes, which serve tourists in peak season, and a couple rickshaws for the San Sebastian chapter of Cycling Without Age. San Sebastian in its own right served as an excellent backdrop to the exploration of cargo bike logistics. Over the past decade, this coastal town has consistently expanded its bicycle network, overcoming its hilly neighbourhoods in a casually innovative manner. 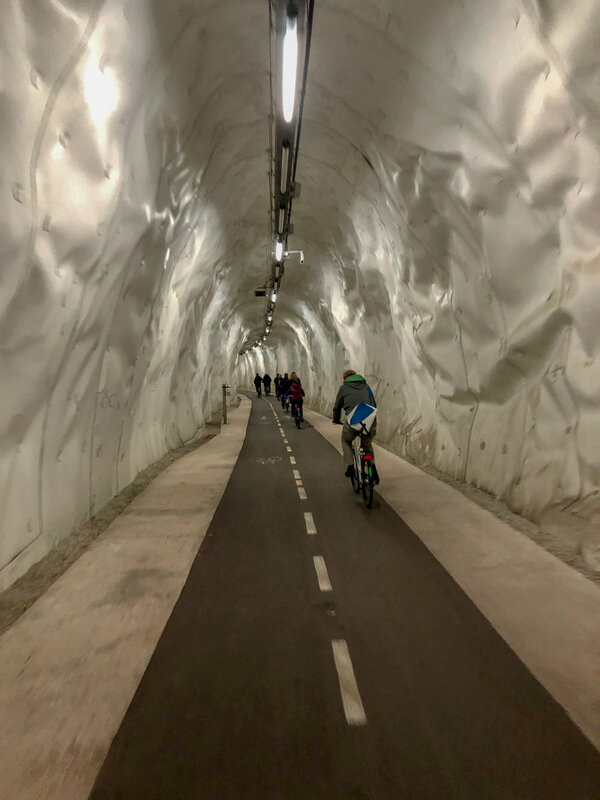 With bus service for bicycles on hilly stretches, an electric bike share scheme, a repurposed rail tunnel connecting two otherwise distant neighbourhoods, and forthcoming bicycle escalators, San Sebastian is demonstrating how the bicycle fits into cities of all shapes and sizes. Thanks to our colleagues on the project, and especially the City of San Sebastian for hosting! While some may associate cycling in Kazakhstan with the country’s Astana Pro Team, the City of Shymkent is working to facilitate cycling as an everyday mode of transportation. Our team visited to collect data and begin work on an upcoming bicycle network strategy. Copenhagenize CEO Morten Kabell spoke on bicycle urbanism at the Nordic Smart Cities project in two Colombian cities, Medellín and Bogota. The Eurométropole of Strasbourg is developing a network of cycle superhighways, called vélostras, to connect all of the cities within its metropolitan area. Copenhagenize Design Co. designed a logo, visual identity, and comprehensive wayfinding strategy. Copenhagenize Design Co. is excited to announce that we are working in collaboration with the Hamburg Metropolitan Region to develop and promote a network of regional cycle routes over the coming years. Morten and James of our Copenhagen office visited Shymkent, Kazakhstan to discuss bicycle urbanism with the Mayor, city staff, and the national bicycle fund, Velocity.kz. In Dunwoody, a small municipality outside of Atlanta, Georgia, less than 36 percent of streets have sidewalks, and only 7 percent have bike lanes. Hosting the annual Canadian Council for Urbanism conference and city officials from London, Ontario in Montréal. In the second half of our Swiss tour, we explore the bicycle infrastructure in Bern and Basel. Exploring the good, the bad, and the ugly of bicycle infrastructure in Geneva and Lausanne. This municipality of 21,000 is well on its way to setting the standard for other North American suburbs facing the mobility barriers that come with automobile-centric design. This year in Copenhagen we’ve been happy to host over 500 visitors from more than 20 different countries.